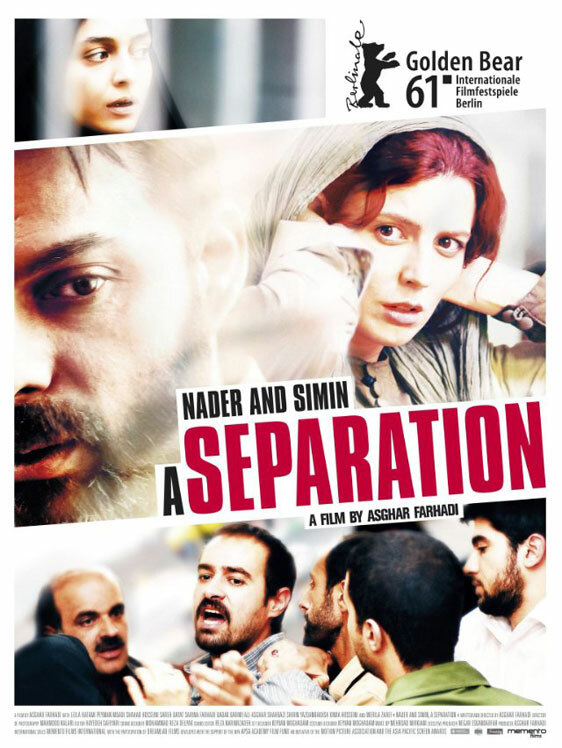 An unbelievably taut thriller of the emotions, A Separation’s only misstep is its title (or at least the English translation). It simply doesn’t sell the film as well as I feel it could; the movie could easily be called Lies and Revenge or Savage Life or Vengeance. The astonishingly rich and sharp script follows its own beautiful path, resisting any sense of formula or predictability. It is a completely original film. It starts simply, and powerfully: a couple sit before an authority figure of some variety (a judge?) seeking a divorce, and a custody decision. She wants to leave Iran, perhaps permanently; he does not. We immediately get a strong sense of the nature of arbitration in Iran that will feel like chaos to a Western audience, both sides essentially bickering in front of us (we hold the arbiter’s POV) with little regard to any sort of formality. There’s no order in this court. From here the story spins off in what seem like many directions until the real plot emerges, and when it does, it is vast and complex; suffice to say, two couples come into a legal dispute, and we see that much huger issues than simple divorce are also dealt with, in Iran, in the same way – still people arguing over the top of each other in front of a single arbiter: no jury, no witness dock, no trial sketch artist. The arbiter must act as much as a detective as a judge, and the case he faces here is, while simple on the surface, hugely complicated in its emotional, moral and religious shades. It is the best “what would I do in this situation?” film I’ve seen in ages. In fact, it’s simply the best film I’ve seen in ages. It deservedly just won the Academy Award for Best Foreign Language film, as well as the top prize at last year’s Sydney Film Festival. It’s fast paced, exciting, thrilling, edgy, moving, engaging, and – in its portrait of a justice system almost radically alien to the one I live under – absolutely fascinating. I couldn’t recommend it more. A truly five star experience.